Jind, March 18: With the Election Commission releasing the notification for the first phase of Lok Sabha, the poll bugle is on, and political parties are all set to target their rivals. In the latest, Communist Party of India (Marxist) general secretary Sitaram Yechury lashed out at Prime Minister Narendra Modi for putting the blame on the Congress for his failures. Addressing a joint political rally of Left parties in Jind, Yechury lambasted Modi for addressing the issues of farmers properly, due to which farmers were forced to commit suicide ‘in large numbers’ in his tenure. He even called PM Modi a habitual blamer, who put the blame on others’ shoulders to cover his own. Lok Sabha Elections 2019 Schedule: Voting In 7 Phases From April 11 to May 19, Counting And Results On May 23; Check All Dates For General Elections. 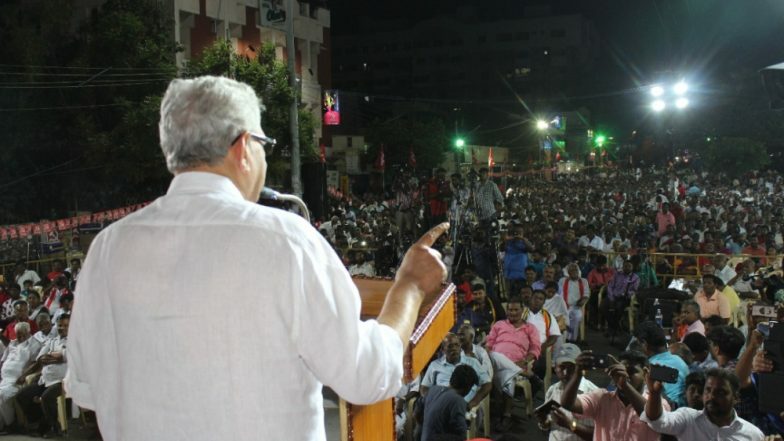 Alleging that national assets were privatised under Modi’s tenure to benefit his corporate friends, the CPI(M) politburo member said, “It is because of this that 73% of national wealth today is controlled by 1% of people while large sections of the population are languishing in abject poverty despite no dearth of resources in the country.” Election Commission Releases Notification for First Phase of Lok Sabha Polls 2019. Among other issues that Yechury pointed out include the alleged corruption in Rafale fighter jets deal, where he accused the PM of helping his corporate friend Anil Ambani. The CPI(M) general secretary even slammed Modi for trying to draw political mileage out of airstrikes in Balakot after the terror strike in Pulwama. He even claimed that Modi’s ‘Main Bhi Chowkidar’ campaign as fake.